When integrating solar heat into industrial or commercial processes, the aim is to identify the most technically and economically suitable integration point and the most suitable integration concept. Due to the complexity of heat supply and distribution in industry, where a large number of processes might require thermal energy, this task is usually not trivial. Within Task 49/IV Subtask B several documents have been developed to assist with the necessary steps when planning the integration of a solar process heat plant. 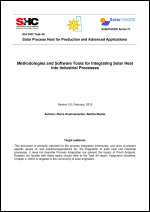 Within IEA Task 49, Subtask B is focusing on the integration possibilities of solar heat in industrial processes. In this context, also the questions are tackled: - Which new technologies can stimulate the use of renewable (solar) heat? - Which technologies must be developed for reacting best on the hybrid energy supply in future? 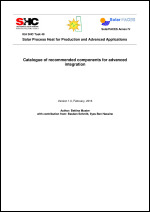 In this catalogue, software and hardware components are described that can help realising the integration of solar process heat in an advanced way. The Efficiency Finder, also known as Zero Emission WikiWeb or Matrix of Indicators is a reference book that contains important information on unit operations, energy supply technologies, process technologies, best practice examples, and guidelines for implementation of efficiency measures and renewable energy technologies. The website (http://wiki.zero-emissions.at/) can be used as an inter-active compendium by process engineers, energy managers, RES experts, etc. to support their work e.g. by providing measures for energy efficiency and finding suitable solar applications in production processes. 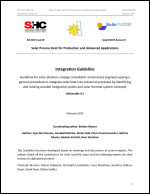 This document is primarily intended for the process integration community, and aims to present specific issues of, and solutions/approaches for, the integration of solar heat into industrial processes. 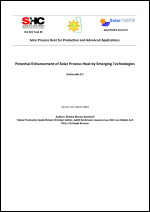 Guideline for solar planners, energy consultants and process engineers giving a general procedure to integrate solar heat into industrial processes by identifying and ranking suitable integration points and solar thermal system concepts.